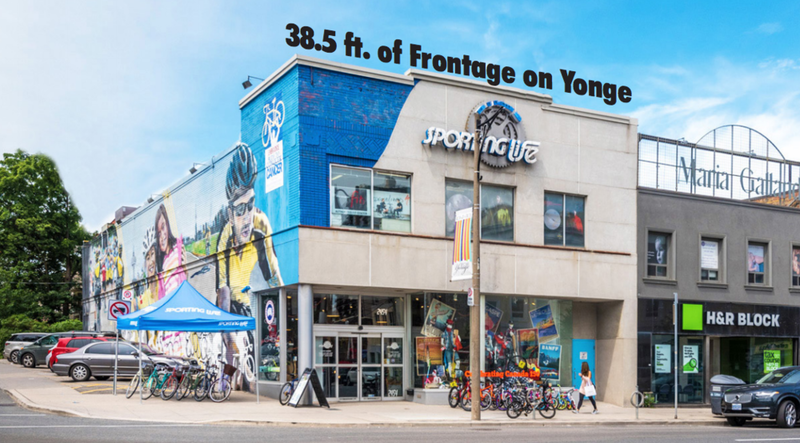 An notable retail building is for sale at 2454 Yonge Street in midtown Toronto, currently housing Sporting Life Bikes & Boards as a single tenant. The bid date for interested parties is September 14 of this year. The three-level corner commercial building boasts excellent visibility on Yonge Street with 38.5 feet of frontage, as well as expansive frontage on Roselawn Avenue. The 13,116 square foot building includes a ground floor of 4,303 square feet, a second floor with 4,408 square feet, and a basement level spanning 4,405 square feet. The lot size is 5,550 square feet, and the site includes seven valuable parking spaces.